Australian TV networks are still programming local drama in head to head battles with Nine confirming it will launch its thriller Hyde & Seek against Seven’s The Secret Daughter on Monday October 3rd. The announcement follows recent programming moves that pit Doctor Doctor, The Wrong Girl and Deep Water in Wednesday night timeslots. This comes after a light first half of the year where commercial networks went months without any new Australian drama. 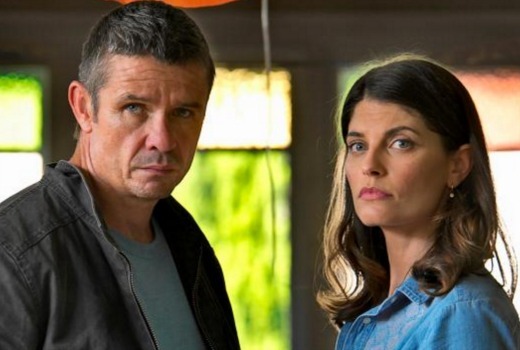 On the weekend Seven confirmed its launch date for its 6 part drama The Secret Daughter. Nine has been planning an October launch for some weeks and had presumably been eyeing the same date. While it will launch off the back of The Block, Seven has Secret Daughter following its X Factor launch. Last year network programmers promised they wouldn’t be copying one another this year. Matt Nable (Underbelly: Badness, Gallipoli) stars in the gripping new drama series Hyde & Seek which will premiere on Monday, October 3 at 8.45pm on Channel Nine. Joining Nable in an all-star cast are Deborra-lee Furness (Correlli, Jindabyne), Mandy McElhinney (House of Hancock, Love Child), Zoe Ventoura (Packed to the Rafters), Emma Hamilton (The Tudors, Mary: The Making of a Princess), Tai Hara (Home and Away), Claire Lovering (San Andreas), Jeremy Lindsay Taylor (Puberty Blues), Andrew McFarlane (Devil’s Playground, Love Child), and Aaron Fa’oso (East West 101). When his best mate and partner is killed in a random attack, Detective Gary Hyde (Matt Nable) vows to bring the killer to justice. Together with his new partner Claire McKenzie (Emma Hamilton), Australian Federal Police boss Jackie Walters (Mandy McElhinney) and Australian Security Intelligence Organisation chiefs (Deborra-lee Furness and Jeremy Lindsay Taylor), Gary uncovers a criminal underbelly of murder and fraud as he is thrust into the secretive world of homeland security. In a world where crime has no borders and everyone has something to hide, Gary’s wife (Zoe Ventoura) and young children find themselves in the firing line. Hyde & Seek is made for the Nine Network by Matchbox Pictures, with producer Stephen Corvini (Schapelle, Devil’s Dust) and Executive Producer Debbie Lee. “Hyde & Seek is a view of some of the timeliest & most engaging stories going on in our world right now and Matchbox Pictures are delighted to have partnered with Channel Nine to bring this series to life”, Corvini said. The creators/writers are Gavin Strawhan (Step Dave, Nothing Trivial) and Rachel Lang (Outrageous Fortune, Blue Rose) with writers Niki Aken and Michelle Offen. The series is directed by Peter Andrikidis (Catching Milat, Fat Tony & Co.), David Caesar (Underbelly: Razor, Miss Fisher’s Murder Mysteries) and Daniel Nettheim (Doctor Who, Ripper Street). 8:45pm Monday October 3rd on Nine. Its almost as if they leave them on the shelf all year until the last possible moment to air them. Says everything about their attitude to original drama. I don’t record…I do watch catchup….on some networks….but I can only consume so much….and with time spent on this machine (PC)…I do not want to be sitting in front of a screen 24/7…I do a lot, as is. Smart thing is to record both and cut out the ridiculous amount of ads that will be in each of them. As a viewer of Aussie tv it infuriates me that the networks have all this space on their schedule to just go and pit them against each other. I love Australian drama and its just ridiculous. I’ll be watching The Secret Daughter and recording Hyde and Seek purely because i’m more interested but i’m sure others will do the opposite. Its a lose-lose for Aussie drama viewers honestly. Networks need to take a look at themselves. Really looking forward to both of these shows, they both look great. My recorder will be running hot that night with the shows on 7flix too. This annoys me. We wait and wait for Aussie shows and then they put them all on the same night. Networks if you’re reading this I demand you to reconsider. Sincerely, Australian viewers. If we had a like button here I’d have liked your comment. So frustrating when they do that. Is that the one that’s not on Seven? This is ridiculous. I like watching and supporting Aussie Drama! There has been a famine in the first half of the year (except ABC Thank you) and now a glut! Well I will already have a show from multi channel set to record, so now I am forced to choose….Dislike this programming as Aussie dramas deserve better! I remember when All Saints, Blue Heelers and Water Rats competed against each other! FYI Hyde and Seek looks like a good Aussie crime drama… hope 9 don’t let me down! Why are we getting so many new shows at this time of year. How many success stories are there for shows debuing in the final 1/4 of the year? I can’t think of any. Always give Aus dramas a go but its a shame when we go from nothing to so many on at once as unfortunately something ends up giving – and no doubt the ratings will show. Out of 5 nights a week Aus drams can air, why only use a few?